Chicago's beloved Rainbow Cone could move to the 'burbs and stop hiring as many area students if Mayor Rahm Emanuel's plan to raise the minimum wage to $13 an hour comes to fruition, 19th Ward Ald. Matt O'Shea said Monday. 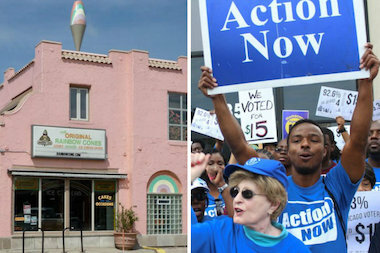 CHICAGO — Chicago's beloved Rainbow Cone could stop hiring as many area students if Mayor Rahm Emanuel's plan to raise the minimum wage to $13 an hour comes to fruition, Ald. Matt O'Shea (19th) said Monday. Even worse, he warned — it could move to the 'burbs. Lynn Sapp, owner of Beverly's Original Rainbow Cone at 9233 S. Western Ave., made an emotional appeal against raising the city's minimum wage to members of a City Council committee Monday. "How much is a cone going to cost for a family that comes in?" Lynn Sapp, owner of Beverly's Original Rainbow Cone, said during a hastily scheduled committee meeting Monday. "I'm a businessperson trying to make a living and stay here." Aside from its stack of flavors, Rainbow Cone is known for hiring local students over the summer and its brightly colored building in Beverly. Sapp said the ice cream shop has been in business 88 years, and "my goal is 100," but she decried taxes as "the bites that come out of that cone I serve" without actually addressing the minimum wage. O'Shea, however, said almost doubling the minimum wage from the state's current $8.25 an hour would lead Original Rainbow Cone to halve the 100 students it typically employs each summer, if it doesn't relocate "across the street" to suburban Evergreen Park. Sapp never mentioned the possibility of relocating when she testified before the committee. Dan Costello, head of the Home Run Inn pizza chain, said he didn't "understand the math" of the potential wage increase, which the Emanuel administration says will only increase business costs 1.5 percent in the first year. He looked at the planned 21 percent increase in the minimum wage just in the first year, from the state's current $8.25 to $10. "I think the number's five times higher," he said. Michael Negron, of the Mayor's Office, said the plan would bring 70,000 Chicago workers out of poverty, 5,000 of them single mothers, and would have an $860 million impact on the local economy, with low-wage workers expected to spend the money in their neighborhoods. "The boost in income comes back to the local economy," agreed Ald. Walter Burnett (27th). Emanuel administration officials suggested Monday that the city was racing a statewide bill in the General Assembly that could limit Chicago's ability to raise the minimum wage in the city above the state level. Ald. Tom Tunney (44th), who also owns the Ann Sather restaurants, voted against Emanuel's plan for raising the minimum wage. Tunney had sponsored a competing proposal that would raise it to $10.10 per hour. Tunney said he was skeptical of Emanuel administration claims that the hike would trigger only minimal increases in business costs the first year. "I think your figures are way low from the reality here," Tunney said. "The companies are going to raise prices and reduce labor." O'Shea called the minimum wage increase a "job killer" and said it "declares war on Chicago's small-business community," especially in wards on the city border such as his own Southwest Side area. "My fight here is to protect my community and protect business owners in my community," O'Shea added. Ultimately, Emanuel's fast-tracked measure to raise Chicago's minimum wage over the next five years cleared the Workforce Development Committee and will head directly to a special meeting of the City Council on Tuesday.